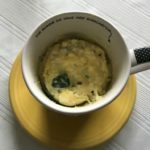 Combine the spinach and water in a microwave-safe mug or ramekin. Microwave on full power for 1 minute. Drain off excess water. Stir in the remaining ingredients with a fork until everything is combined. Microwave on high power for 30 seconds. 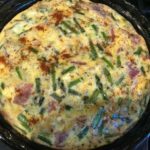 Stir, then microwave for another 60-90 seconds or until eggs are set to your liking. If you avoid dairy, omit the cheeses and add in more vegetables or use a dairy free cheese. Top with avocado slices or salsa. Whisk all ingredients together until smooth. Drop by tablespoonful into a preheated skillet with a bit of coconut oil melted in it to prevent sticking. Cook on each side until nicely brown. Serve with fresh fruit and/or eggs. 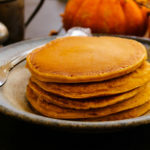 You could also use the pancakes in place of bread or English muffins to make an egg sandwich. Freeze leftover pumpkin in pre-measured amounts in baggies and you are all set for for the next batch– or you could toss into your protein smoothie.